Liked it? Grab the book! Thanks a lot A. Personally I think this is one of my best. I love the way you narrate the story:) Interesting one..Good Luck ! Thank you so much Spandana. Much appreciate the wishes. Its awesome ma'am. You always manage to create the magic. I love you for all ur works..
All the best for this book...DO COME TO CHENNAI THIS TIME TOO.. Thanks so much preethy. Yes indeed, it is a very different and an unusual story. Nooooo....I couldn't have read all that so fast. Few more pages please please please. 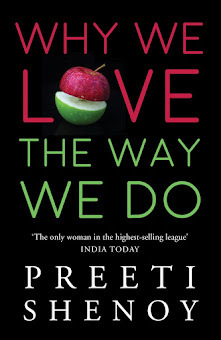 preeti you made me curious...i wish the copy of your novel in my hand nd i could read it in one go!! Thank you Alka! :) It is indeed one of my best. Personally a book, close to my heart. It was awesome preeti maam.. I never actually ordered any book just by reading it's first few pages but i must say ur upcoming book really left me excited & yes i ordered it waiting for my copy.. Hope u'll organise a event in nagpur for this one.. Thank you so much Amrut. That is a huge compliment. I will definitely try and come to Nagpur this time. This book is very different from the usual love-stories going around and it is personally close to my heart. Thank you Salesh and hope you enjoy the read. Thank you so much Preeti for sharing the first 20 pages of the most awaited book of 2014! I am eagerly waiting for December 10th. Best Wishes! Hey...Awesome start and lot of power in the dialogues. Thank you Mona! It is up for pre-order now. Just completed the 20 pages you have shared and can't hold myself to pre-order a copy of this and also blocked a day to completed in a single sitting. I am a new fan of your writings and storytelling skill. Recently, I have completed “Life is what you make it” and purchased the “The secret Wish list” and waiting eagerly for your next one …. Wish you a very Good Luck for the new release “It happens for a reason” !! Thank you Anil. Will surely read the review. There is also 'The One You Cannot have' which has been getting good reviews, and that was my last book. Not only that at end of each book,it always gives us a message i.e hopes and motivation to keep going . Your first book I read was '' A tea for two and a piece of cake '' which was amazing and then i bought all of your books.. My personal favourite is ''“Life is what you make it” and '' THE SECRET WISH LIST '' .. Honestly After reading that , I too have listed down my wish list. Thanks for inspiring me.. I really hope that one day I can also learn & pen down something creative . ( Recently started writing blogs and daily journals )..Please do give us some tips & tutorials for beginners like me... It will really help us. 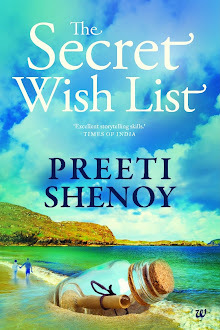 PREETI SHENOY is the phenomenon!!! Not stupid Chetan Bhagat. Your books are way better than Chetan's. I think in a few years time, you will surpass him as the highest selling Indian author. One more thing- Try to get your books to the rural markets. Good luck. I love this novel...and I am biggest fan of yours ! !